"If I say I won't give them to you... would you kill your own father?" "If I say I won't give them to you... would you kill your own father?" "do you have someone to protect?" The above info came from Dale Nash, and was edited by yours truly (contact me). The image came from InuTaisho aka Inu-Papa. Inu no Taisho is a fictional character from the InuYasha series. He is the father of Sesshoumaru and InuYasha. Inu no Taisho is actually a rank that stands for General of the Dogs. Most people refer him as The Great Dog Demon. He is assumed to be more than 3,000 years old, but this is not confirmed. Toga can transform to a gaint dog just like Sesshoumaru the only differences are that he doesn't have a crecsent shape moon on his forhead and he is atleast 36 times taller and 40 times longer. Inu no Taisho was a taiyoukai (great demon) lord. He had two sons, by different mothers. 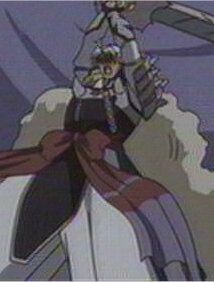 The mother of his son Sesshoumaru is a mystery, as there has been nothing revealed about her in the anime. 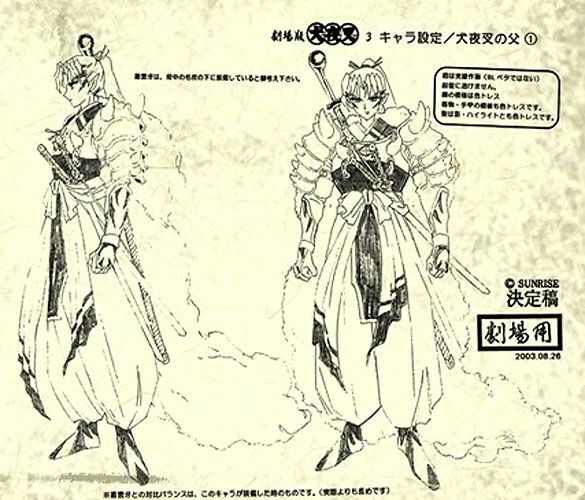 Sesshoumaru's mom has made an appearence in the manga, however, and we learn that she is alive, is also a taiyoukia, lives in a great palace, and possesses a magical item. He fell in love with a human hime (Princess) called Izayoi, with whom he would have his next son, InuYasha. Inu no Taisho was undoubtedly incredibly powerful, the old flea Myoga once described the Taiyoukai lord as "The demon of demons" which implies that he was a very powerful being. Inu no Taisho ruled in the Western part of Japan and fought with many demons before the birth of InuYasha such as, Hyoga and Menoumaru, Oyakata (former leader of the Panther tribe), the deadly Ryukotsusei, and finally Setsuna no Takemaru, with whom he died in battle with. There has been a great deal of conflict over his true name. Many fans refer to him as InuTaisho, an incorrect way of saying Inu no Taisho. This is not his true name, as it is only a rank, as mentioned above. In the Japanese, his name is apparently given as Toga in the third movie. However, this is not confirmed. And even then, it is only his Japanese name and he still does not have a name in the English translation. He is the demon lord who commissioned the sword smith Totosai to forge Tessaiga (also spelled Tetsusaiga) and Tensaiga from two of his fangs. A third sword, Sounga, was also made, though not from his fang, and not by Totosai. Apparently the swords are of the three realms, with Tessaiga being of Earth, Tensaiga being of Heaven, and Sounga being of hell. The Sounga has a mind of its own and can think and move on its own, but for it to reach its full potential it needs a host, and it has an influence on their actions. If the host is powerful enough, however, like InuYasha's father, then Sounga can be controlled. Note: Some fans have taken to calling InuTaisho "Inu-Papa". The above description came from Roger, and was edited by yours truly (contact me). InuTaisho is the father of InuYasha and Sesshoumaru. InuTaisho and Totosai created the Tetsusaiga and Tensaiga. InuTaisho loves Izayoi, but sadly InuTaisho never sees his second son InuYasha. InuTaisho dies the same day InuYasha is born. InuTaisho had another sword, The Third Fang Sounga. InuTaisho appears in the 3rd InuYasha movie. InuTaisho finds that Takemaru has killed Izayoi. 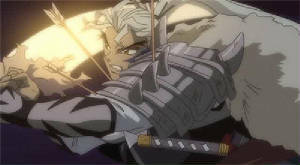 He revives her with the Tensaiga, and sees Inuyasha within her arms. 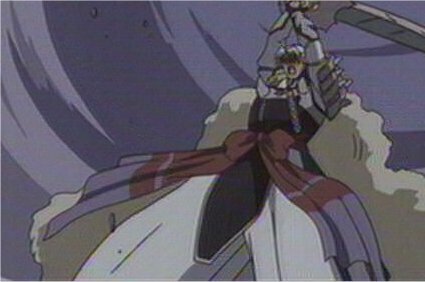 InuTaisho received damage inflicted during his fight with Setsuna no Takemaru, and dies shortly thereafter. Though as he makes clear to Myoga, he was already dying from his wounds fighting Ryuukotsusei. The above description came from Dale Nash, and was edited by yours truly (contact me).